There are certain aspects of grooming that cats cannot do themselves. This is despite the fact that cats are very fastidious creatures. They can lick and groom themselves many hours, but they can never brush their teeth. You can give them cat kibbles to nibble on, but these are often not enough to clean their dentition. Your helping hand is a fundamental requirement to ensuring the best possible oral and dental health for your kitty. The problem is that cats don’t have large mouths to work with, unlike dogs. Most cats do not like being carried or handled for too long as well. As such, brushing the feline teeth can be very challenging for the newbie cat parent. But to brush its teeth is an important responsibility that all cat owners need to shoulder. Here’s how you can brush your feline friend’s teeth the right way. Before we sit down to brush our cat’s teeth, it’s important to pick the right oral care products. At the top of the list is an appropriate toothbrush. Your cat’s mouth is smaller than that of a dog so you have to choose one with a smaller brush head. It is also wise to pick a cat toothbrush that has softer bristles to help minimize the incidence of bleeding gums. There are also toothbrushes that you can place over your finger. Again, look at the size so that it will not be too big for your kitty’s mouth. Next is the toothpaste. Human toothpastes are a big no when it comes to pet oral care. The toothpaste we use contains chemicals or substances that may upset your cat’s tummy. Remember that pets don’t know how to spit the foamy toothpaste. Instead, they swallow it. This can cause different health problems for your cat. As such, the toothpaste for your cat should have very specific formulation for felines. 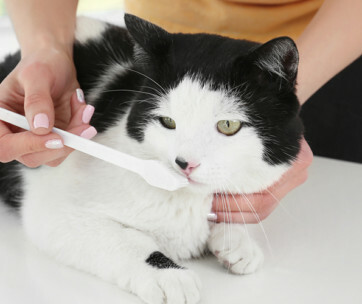 Brushing your cat’s teeth doesn’t always start with the toothbrush and toothpaste, however. As such, you will also have to get ready with strips of gauze. We’ll explain why later. The success of your feline teeth brushing chores is dependent on how well your cat behaves itself during the activity. Most cats are not keen on having someone hold them for so long, let alone tinker with the teeth and mouth. As such, before you can begin with the regular task of brushing your cat’s teeth, you need to help it learn to accept the activity as part of its regular care. This may be easier said, though. Unlike dogs, many cats may not be that social that they don’t like their owners or anyone else holding or carrying them. 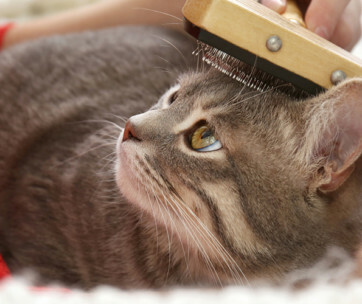 For cats that do love the attention, teaching it to like brushing should be a walk in the park. First, place your cat on your lap. It is best to do this while your cat is in a good mood or in a calm mood. Some cat parents play with their fur babies before carrying them onto their laps. By then the cat will be a bit tired that it may no longer have the energy to resist your actions. Next, run your hands over your cat’s head and face. Let it sniff and lick your fingers. 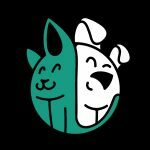 To help you with this, you can dip your finger in chicken broth, tuna water, or any other liquid that your pet may like. This will stimulate your cat to lick your fingers. The point is for you to make this a very pleasurable experience for your kitty. Allow it to grow accustomed to having your hand in front of its face and your fingers right outside its mouth. You may have to perform this several times until your cat is already very eager to sit on your lap in anticipation of the tasty treat. After a few sessions, you can start rubbing your “flavored” fingers against your cat’s teeth and gums. Do this slowly and gently as it can startle your cat. Feline teeth are sharp so you don’t want to have your fingers cut off because you are not careful enough in rubbing its teeth and gums. Rub your finger from the gum line and towards the cutting edge of its teeth. This will help mimic the movements of tooth-brushing later on. You can also move your finger in a circular motion. Always praise your cat afterwards for being a well-behaved kitty. Make sure that the tone of your voice is one of happiness. The whole idea about getting your accustomed to the feel of your fingers rubbing against its teeth and gums is to make it ready for the next step. This time, you will need to wrap your finger with gauze before dipping this in your chicken broth or tuna water. You can then rub your gauze-wrapped finger against your pet’s gums and teeth. Keep in mind to be gentle. Your cat may think that your “finger” feels different. You can move your finger in a circular motion, making sure to touch the gum line. This is where most of the food particles can get stuck. Also rub your finger from the gum line towards the edge of the teeth. This will help dislodge whatever particles or debris is present on the pet’s teeth. Do this several times before moving on to the next stage. Once your cat has grown accustomed to the feel of the gauze on its gums and teeth, it’s time to use its cat toothbrush. If you don’t like using a toothbrush for cats, you can use a dental sponge or a dental pad instead. Don’t put cat toothpaste yet. Instead, dip the toothbrush in chicken broth, tuna water, or any other solution that it is accustomed to. What you’re trying to do here is acclimatizing your pet to the sensation of the toothbrush bristles or the dental sponge. Be gentle in your brushing. You also don’t need to brush all of your cat’s teeth yet. Remember, the goal here is to acclimatize your cat to the sensation of the brush. You can work on one or two teeth at a time until your cat is comfortable with the feeling of brushing its teeth. If your cat is already feeling comfortable with the feel of brush on its teeth, you can start applying pet toothpaste on the toothbrush. Use only very minimal amounts the first time. This is to accustom your cat to the flavor of the toothpaste. To be more successful, pick a pet toothpaste that has the same flavor as the solution you use to dip your finger and gauze in. If you’re using chicken broth, it’s a good idea to get a pet toothpaste that has chicken flavor. Let your cat lick the toothpaste. Don’t worry. As long as the toothpaste has pet formulation, then it should be safe for your kitty. Don’t forget to praise your cat. Your cat should already be accustomed to the feel of toothbrush rubbing against its teeth. It should also have no issues licking the pet toothpaste you’re going to use. If you can ensure that your cat can accomplish these two things, then you’re ready for the real task of brushing your cat’s teeth. Always start on the outer sections of its teeth. Raise the lip on one side of your cat’s mouth and brush its teeth in a gentle manner. Start the movement of the brush from the gum line and work your way towards the tooth edge. So if you’re working on the teeth of the lower jaw, the brush movement is upwards. If you’re brushing on the teeth of the upper jaw, the brush strokes are downwards. If you were able to train your cat to love the taste of the toothpaste, you should have no problems opening its mouth. Your cat will open its oral cavity for you. In the event that your kitty is a bit shy, you can pinch both its cheeks between your fingers. Be gentle. Be patient. Don’t expect to brush all of your cat’s teeth in one go. You can brush 3 to 5 teeth at a time. You can brush another 3 to 5 teeth another day. This will help minimize traumatizing your cat. 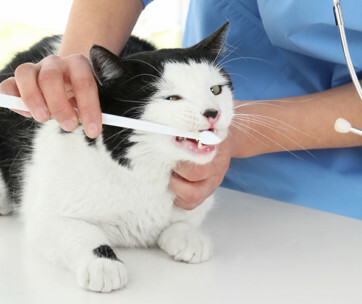 Once your cat is already accustomed to the feel of brushing, then you can brush all of your cat’s teeth in one go. There will always be instances when a more professional, more thorough cleaning of the cat’s teeth is necessary. Visiting a pet dentist can help you make sure your cat doesn’t have any tartar or plaque that may be present on its teeth. These are conditions that may be more challenging to remove with ordinary brushing alone. You can visit your pet dentist at least once a year. Brushing your cat’s teeth doesn’t occur overnight. It is a painstaking process of familiarization. But once your kitty is already accustomed to the sensation of brushing its teeth, it will be easy as 1-2-3.